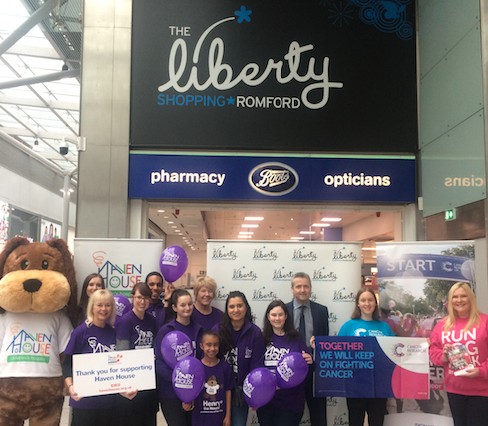 The Liberty Shopping Centre in Romford has revealed a two-year charity partnership with Haven House Children’s Hospice and Cancer Research UK. The shopping centre will support the charities by using the centre as a platform to promote their services to the local community, as well as to fundraise for key campaigns over the two years. Local charity, Haven House Children’s Hospice provide palliative and holistic care for babies, children and young people who have life-limiting and life-threatening conditions, while Cancer Research UK carry out world-class research into the prevention, early diagnosis and treatment of cancer and promote awareness of the disease to people across the UK. Shopping Centre Manager at The Liberty, Jonathan Poole commented: “We are excited to announce our two-year partnership with both Haven House Children’s Hospice and Cancer Research UK. “Haven House Children’s Hospice support children and young adults with life-limiting and life-threatening conditions, while Cancer Research UK play a fundamental part in finding a cure, as well as the prevention of cancer. Mike Palfreman, Chief Executive of Haven House, said: “We are thrilled to begin a new and exciting partnership with The Liberty Shopping Centre. “As a Havering resident I know just how popular The Liberty is with shoppers who come from far and wide to visit its stores each week. Jessica Allchin, Local Fundraising Manager in Essex for Cancer Research UK, said: “We are delighted to be benefiting from this partnership with The Liberty Shopping Centre. “One in two people in the UK will be diagnosed with cancer at some stage in their lives, but the good news is more people are surviving the disease than ever before. “This partnership will help us to raise funds and communicate our groundbreaking scientific and clinical research with the local area”.